This is the original pressing of this release, issued in an unstickered picture sleeve without barcode, with no e-mail/web addresses on the "ORDER TO DANCE" center labels (no "IN"). There is also a 2001 repress with email/web addresses, and a 2006 "Vintage R&S"-stickered repress. 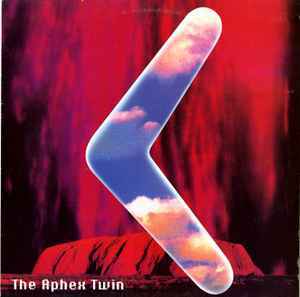 Besides the massively well known title track, this seminal Aphex release contains some awesome classic industrial techno from RDJ. Flaphead is a track that contains some of the same drum patterns used in SAW 85-92's final track Actium, however the similarities end there. A brutal 4/4 warehouse style assault gives birth to a ferocious acid beast that rides alongside spooky pads until it is screaming at full force, yet never overpowering the percussive attack. Phloam begins with an elastic electropulse which pairs up with a dirty industro-breakbeat. After a short while, some Aphex pads once again show up and reveal the melodic potential of the percussion - this is the essence of superior industrial technique; controlling the pitch and tone of each noise to create a symphony out of klings and klangs. Halfway through, the track goes electrostatic (in reference to the Plastikman b-side of Krakpot which shows up one year later). This record won't run you a fortune these days, grab yourself a copy if you haven't already and watch people wig out when they hear these under-represented jams. What could I say that hasn't been said? Well, yes indeed, this is a fabtasmical release, we know that. Digeridoo seems to be everybody's favorite, we know that. But do we know that A - this could be one of the most singularly UNIQUE "techno" records ever put out? Look out, though, Luke Vibert and Jeremy Simmonds were crankin' out some pretty tripped out stuff too, among MANY other less "out there" but equally brilliant and unique techno tracks that were being put out in the early early 1990s. And B - I could be wrong, but that sounds like a Roland TB-303 Transistor Bassline to me doing that digeridoo! If it is I ask - who but Richard D James would have ever thought to make a 303 replicate NOT a Bass Guitar, but a DIGERIDOO??? Moral of this review/comment - Richard D James as Aphex Twin always was and still is in many ways a real innovator in the realm of techno music. I've heard some of his stuff I don't even know the titles of but would kill to own on vinyl. Now why is this such an in-demand release? Because R.D.J. has earned every bit of his widespread respect - he IS that good. Spooky ... mysterious ... insane. Australia's vintage instrument forms the basis for this haunting track. Dark & obscure, but great material for parties as they used to be thrown in the 90's. The digeridoo is accompanied by a breakbeat kind of hi-hat line and spooky sounds. Love the sirens towards the end of the song. What a fabulous piece of music. All 4 tracks are very strong hard pieces of techno music. However the main track Digeridoo is one hell of a ride. A breakbeat fuelled hard techno stomper with an analogue digeridoo that morphs and mutates until the listener can take no more. I had the pleasure back in early 1993 of seeing the Aphex twin play a live set in both Glasgow(Pussypower) and Edinburgh(Pure) where he played a mixture of heavy techno and some highlights from his Selected Ambient Works Vol 1. However Digeridoo was the absolute highlight. I do have to admit that whilst watching the show at Pure Edinburgh I was under the influence of some rather potent LSD which certainly enhanced the performance. A delight indeed! Unfortunately I was only 9 years old when this record came out and so can't give any insight into how revolutionary it was at the time, but I just picked up the R & S repress and felt like giving my own thoughts on the release. I was first exposed to these tracks about 2 years ago via the Classics compilation on R & S - they completely blew me away then and still do now, and I can't imagine myself ever getting bored of any of them. I'd echo everything that's already been said about Digeridoo, it's a truly unique classic. I recently had the pleasure of hearing Aphex Twin himself play the tune to a 2000 sell out crowd at the Glasgow Barrowlands and it completely blew the roof off. There is still a lot to be said of the other tunes on this release. On the A side Flaphead is another techno masterpiece that goes much darker than Digeridoo. It's not long before its pounding 4/4 beats are accompanied by a haunting electronic synth line that remains steady throughout the rest of the tune. I'd could imagine this tune being dropped to a more open minded crowd sometime during the early hours of the morning. On the flip side Phloam is relentless from start until finish, with some killer drum programming and some industrial sounding effects that maintain a dark vibe throughout the song. Isoprophlex/Isopropanol is another techno destroyer that I've personally witnessed a couple of dance floors going wild to even 10 years on. One of the things that also stands out about this track is the psychedelic break about 4 and half minutes in with the "flowers that bloom in the warmth of the sun..." sample that was taken presumably from a children's TV show. If you come across the repress, don't hesitate to pick it up. This is pure acid, mind bending hard-techno at its best. The track is psychotic and relentless. Richard has used his synths to an amazing effect, if you wanna know what a Roland tb303 bassline rack-synth sounds like, well this is for you. Truly one of his best full-on works ever released. And from out of nowhere (it would seem) came this destructo record. Insane, Digeridoo. Quite an introduction to someone who we would get to know and see become quite a prominent fixture on the scene. One of the most manic and mental techno / acid records ever created. Unbelievable and much better than the shite that Aphex does now. I'm not an Aphex fan as u can possible tell.